Living in Eastern CT or Southwestern RI, you know how just important it is to have a heating system that runs properly. Scheduling your annual heating system maintenance prior to each winter will help keep your equipment safe and efficient, extending its lifespan. An oil-fired boiler or furnace that is tuned and maintained properly can save you up to 10% on your fuel costs each year! Our heating service technicians perform annual heating system tune-ups on all types of oil equipment. Trust our team to recommend additional ways you can save on heating costs at the time of your service. Call us to schedule your maintenance appointment today! Not only will yearly maintenance of your boiler or furnace reduce your heating costs, but it will also help keep your system safe and decrease the risk of a system malfunction. Our tune-up includes the TankSure® Program which provides an ultrasonic oil tank test that helps to protect your heating oil tank and determine if your tank is in need of replacement. 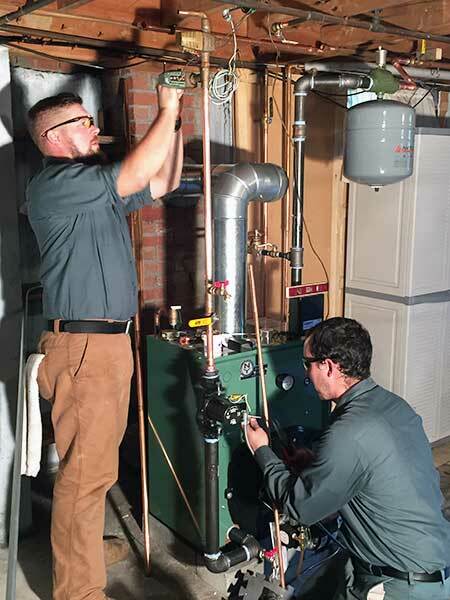 An annual tune-up performed by a Densmore Oil Company expert technician will help keep all of your heating system components safe and efficient each heating season. Call us at (860) 536-7927 to schedule yours!